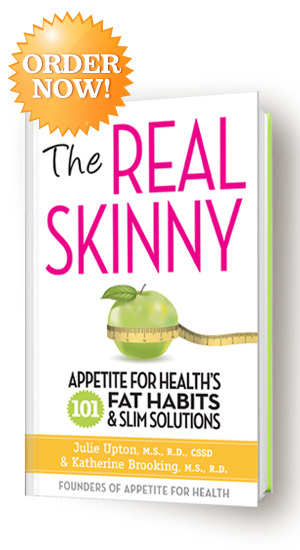 Our new book, The Real Skinny: Appetite for Health’s 101 Fat Habits and Slim Solutions received a great review this week in Publisher’s Weekly. As you probably know by now, the book hits bookstores the first week of April, but you can pre-order it now and when you do so, you get a FREE monthly weight loss meal plan from us! Here’s what the editor’s at Publishers Weekly had say about our new book…. On their popular Web site Appetite for Health, experienced, registered dietitians/nutritionists Upton and Brooking have provided daily advice about losing weight and eating healthy since 2009. So many of their followers, veterans of the weight-loss wars, posted the same questions, complaints, and confessions about their frustrating struggle to lose unwanted pounds that the authors recognized the real problem lay in a set of common “fat habits” people fall into when dieting. This little book, in its skinny 4 in. by 8 in. format, is a compilation of the 101 worst fat habits and the “slim solutions” for overcoming what is often a lifetime of bad behavior and misconceptions surrounding food and nutrition on the part of the dieter. Each of the book’s nine chapters describes fat habits that are sure to resonate with any reader who has ever tried to lose weight. The authors then provide information-packed, highly practical, and easily implemented suggestions and strategies for managing food choices and environment, and asserting self-control. These include suggestions on how to handle stress, begin an exercise plan, become a smart food shopper, set up a diet-friendly kitchen, and enlist the help of friends and family. Chapter seven features a 14-day meal plan, and 20 creative calorie- and fat-reduced recipes appear in chapter nine. Sidebars, boxes, and charts abound, offering calorie and fat counts, recommended “good-for-bad” food swaps, good books for dieting cooks, nutritional info from fast-food outlets, and how to eat “like a nutrition pro” when dining out. Upton and Brooking deliver just what a dieter needs to succeed in losing weight and keeping it off—information, inspiration and example. Here’s Julie talking about the inspiration for the book on CBS San Francisco….